The Schweinfurth Art Center’s acclaimed Quilts=Art=Quilts exhibit will be paired with American Quilts: History and Art, curated by Jonathan Holstein, a world-renown collector and curator who resides in Cazenovia. Both exhibits have an opening reception on October 29th at 4:00 pm- 6:00pm. Awards for QAQ will be announced at 5:00 pm. The exhibit will be open until January 8, 2017. This pairing is an opportunity for viewers to see both contemporary and historical quilting techniques in one visit. American Quilts: History and Art will showcase 21 quilts grouped together by theme such as African American Quilts, Amish Quilts, Figurative Quilts . . . and more. Curator Jonathan Holstein and his wife Gail van der Hoof began to collect quilts in the late 1960s, and in 1971 curated the seminal exhibition, Abstract Design in American Quilts, at the Whitney Museum of American Art in New York. The collection they formed ultimately went to the International Quilt Study Center and Museum (IQSC) in Lincoln, Nebraska. Their exhibitions here and abroad, along with their writing and lecturing, furthered both the appreciation of American quilts as significant designed objects, and encouraged the now-international art quilt movement. In this exhibit Holstein turned his trained eye to the collection of the IQSC and curated this exhibition for the Davis Family Gallery, which is on the art center’s second level. Holstein will also be giving a lecture on the exhibit on Sunday November 13th at 2 pm. The side-by-side comparison of both a historical and contemporary quilt exhibit will demonstrate parallels, origins, and departures of tradition, which is an important topic when discussing quilt making. This year’s Q=A=Q exhibit will feature 65 quilts from 51 exhibiting artists, from all over the world including Belgium, Australia, and Canada, as well as artists from upstate New York such as: Julia Graziano of Manlius, and Ruth White of Ithaca. This year jurors were internationally known artists Judy Kirpich, Terry Jarrad-Dimond, and Valerie Goodwin. They reviewed 298 quilts. Prizes will be awarded by juror Lasse Antonsen at the opening reception. 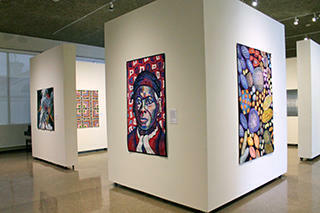 The exhibit is sponsored by Tompkins Trust Company, The Davis Family Trust, and the New York State Council on the Arts. Trunk Shows: Guest Quilters show samples of their work and talk about their quilts. Admission to trunk shows, tours & lectures is included with admission to the exhibits. Admission is $10 for adults. Free entry for exhibiting artists, Art Center members and children aged 12 and under. The exhibits & related events will be free of charge on First Fridays, Nov. 4 and Dec. 2 from 5-8pm. To register for workshops and for more information, please call 315.255.1553 or visit www.myartcenter.org. The Schweinfurth is located at 205 Genesee St., Auburn, NY and is open Tuesday- Saturday, 10– 5 and Sunday 1 – 5. All photos courtesy of the Schweinfurth Art Center.